Arrival at the Cochin Airport our representative will receive you and take to the hotel. 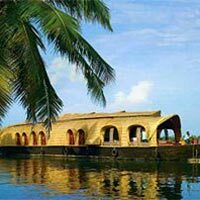 Spend the afternoon with local sightseeing in and around Cochin - the "Queen of Arabian Sea", this is one of the finest natural harbors in the World and was one of the major centers for commerce and trade with British, Chinese, Portugese, Dutch, etc. Sightseeing attractions in Cochin include Dutch Palace, Jewish Synagogue, Jewish Street, St. Francis Church and Chinese Fishing Nets. Overnight stay in Cochin. After breakfast check out from the hotel and drive to Munnar (150 km - 04 Hours drive) on arrival check into the hotel. Spend the day at leisure. Overnight stay in Munnar. Explore more in Munnar during the second day in Munnar. After breakfast, proceed to visit the Eravikulam National Park "where you get to see the endangered Nilgiri Tahr". Later on proceed to visit Mattupetty Dam, Eco Point etc. Back to the hotel after an exciting day. Overnight stay arranged at the hotel in Munnar. Morning after breakfast, continue your journey to Thekkady reaching there in few hours. Check into the resort and relax. Later on proceed for a spice plantation tour. Explore wide variety of spices in Kerala. You may also shop few varieties. Travel by boat on the Periyar Lake to spot the elephants and avifauna for which this reserve is well known. Boat cruises and sunrise and sunset are particularly recommended. Back to the hotel for an overnight stay. After early breakfast check out from the hotel and drive to Alleppey(170 km – 5 hours drive) on arrival check into the hotel. After breakfast proceed for local sightseeing in and around Alleppey-. The stretch of backwater is spread over 900 sq. km. The hamlet clings to tradition and the local population prefers to live adhering to their old ways. Choose a canoe, motor boat or a houseboat and devour the beauty of this backwater paradise at its best. Overnight stay is arranged in Alleppey(Hotel). After breakfast check out from the hotel proceed to Kovalam. Whole day enjoy at Kovalam beach. Overnight stay at Kovalam. After breakfast proceed to Trivandrum sightseeing. Evening back to hotel for overnight stay. After Breakfast drop to Trivandrum Airport. The striking port city of Kochi or Cochin is a tourist's paradise. Lush mangroves, coconut tress reflected in the translucent waters of backwaters, ancient churches, cathedrals and fort - tourists on sightseeing tours of Cochin would find all these and more. Flanked by the Western Ghats on the east and the majestic looking Arabian Sea in the west, Kochi occupies a very strategic location and has been a significant trading zone and attractive tourist destination since time immemorial. The tradition and reputation of this enchantingly quaint port city has maintained till date. Munnar is situated at the confluence of three mountain streams - Mudrapuzha, Nallathanni and Kundala. 1,600 m above sea level, this hill station was once the summer resort of the erstwhile British Government in South India. Sprawling tea plantations, picture-book towns, winding lanes and holiday facilities make this a popular resort town. Among the exotic flora found in the forests and grasslands here is the Neelakurinji. This flower which bathes the hills in blue once in every twelve years will bloom next in 2018. Munnar also has the highest peak in South India, Anamudi, which towers over 2,695 m. Anamudi is an ideal spot for trekking. The very sound of the word Thekkady conjures up images of elephants, unending chains of hills and spice scented plantations. The Periyar forests of Thekkady are one of the finest wildlife reserves in India. Spread across the entire district is picturesque plantations and hill towns that hold great opportunities for treks and mountain walks. 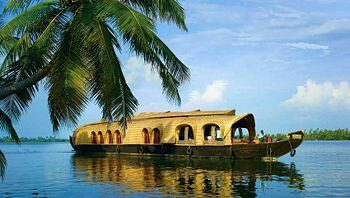 The village of Alleppey is a cluster of little islands on the Vembanad Lake, and is part of the Kuttanad region. The bird sanctuary here, which is spread across 14 acres, is a favorite haunt of migratory birds and an ornithologist's paradise. Egrets, darters, herons, teals, waterfowl's, cuckoo, wild duck and migratory birds like the Siberian Stork visit here in flocks and are a fascinate the visitors. An enchanting backwater destination, Kumarakom offers visitors many other leisure options.